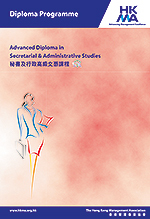 The Advanced Diploma in Secretarial and Administrative Studies programme is designed to prepare secretaries for advancement in secretarial administration and management. This programme provides education and training in business subjects to meet the growing demands of the business sector and reflects the changes in modern office management. This programme commences in April and October each year, and the application deadline is normally two weeks prior to commencement date. This programme can be completed in ten months. It consists of seven modules, with an advanced diploma being awarded upon successful completion of the whole programme. This programme must be taken in sequence and the maximum time to complete the programme is two and a half years.